This year, armyworm infestations were not as severe as last year. Populations did not reach the very high numbers of 2015, but they were early. Growers and PCAs were scouting diligently, and were able to recognize infestations when the worms were small. This gave growers the upper hand and many were ready to make a treatment decision if necessary. Intrepid was used in some fields successfully. We are not totally off the hook yet. We usually get a second peak of armyworm activity during the late boot and heading stages. UCCE is monitoring moth populations in several areas of the valley using pheromone traps. The traps were set up in early July, and the trapping numbers will be shared in this blog and the UC Rice On-line website. So far, moth numbers are low, averaging 2.5 moths/trap/day during the week of July 11. Numbers have decreased since the previous week, when the average was 4.3 moths/trap/day. The location with the highest moth numbers is near Knights Landing, averaging 9.2 moths/trap/day. 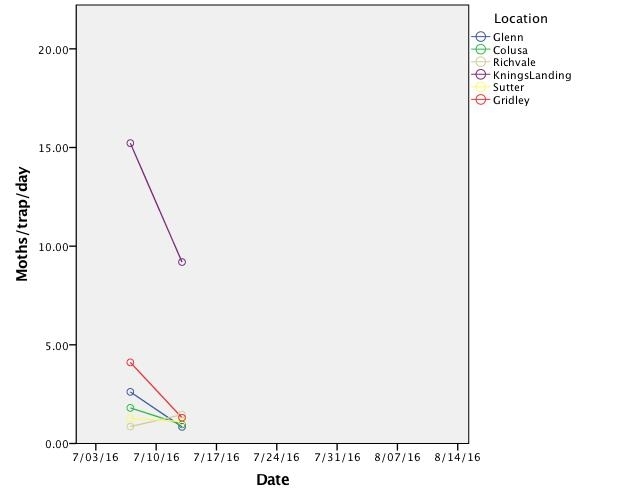 Previous work done by Larry Godfrey, UC Davis Extension Entomologist, found that peaks of 20-40 moths/trap/day might indicate an armyworm larvae peak 7 to 10 days later.